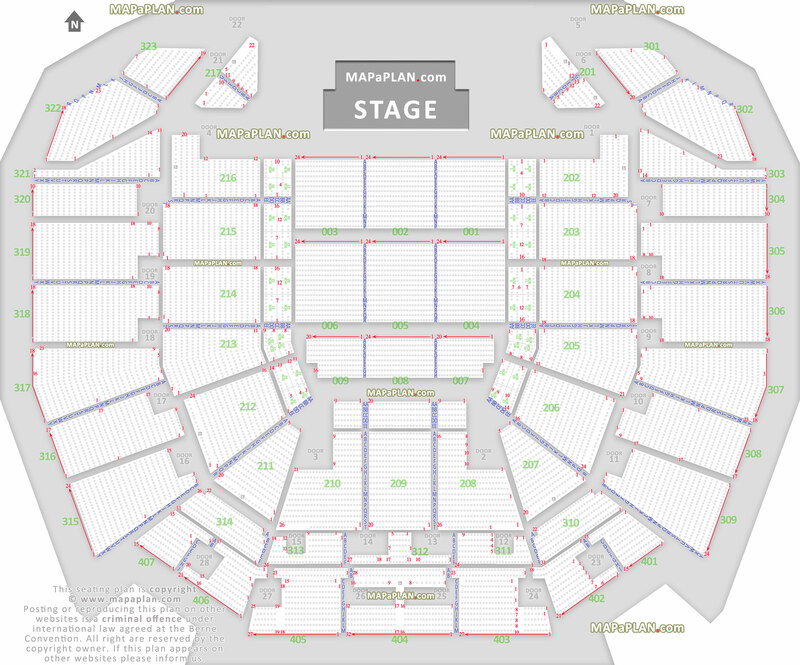 What are the best seats in the Perth Arena, Australia? 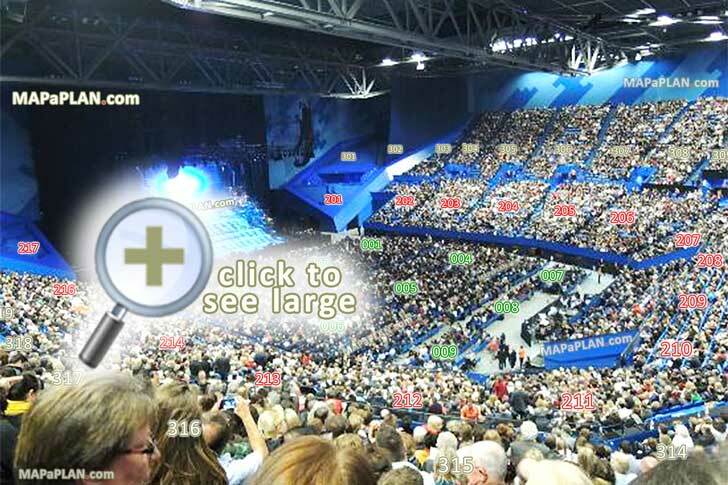 In the end-stage fully seated configuration the best seats in the Perth Arena are the front rows in floor section 002, and then 001 and 003. The remaining floor sections 004, 005, 006, 007, 008, 009 are OK however all floor seating is set on a flat floor so if a tall person is sitting (or standing) in front of you the view may be slightly obstructed/restricted. The floor rows are numbered from A up to R, whereas the seats are numbered from 1 to 24 ascending right to left when looking at the stage. When buying your tickets you can use the seating plan above to find the seat numbers offering optimum central view of the stage. Please note that for some shows the floor seats are removed and the entire floor forms a general admission standing section or sports court (e.g. basketball, tennis, ice hockey rink). 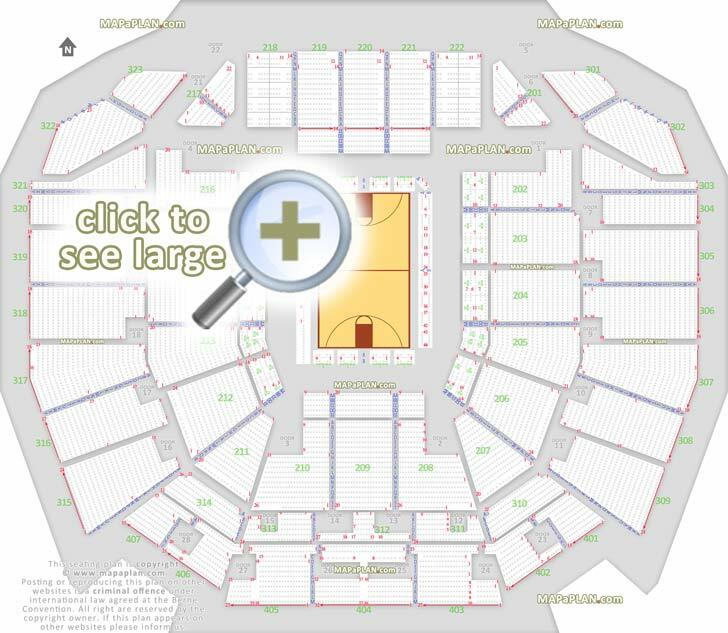 Surrounding the floor are lower and upper tier sections numbered 201-217; 301-323; and 401-407. These are set on inclined risers so even the back rows can enjoy an unrestricted view of the stage. The lower tier seating offers great seats. The top seats are close to the stage in blocks 203, 215, and then 204, 214. In fact, these blocks should offer much better experience than the back floor sections. Sections 206, 207, 208, 209, 210, 211, 212 offer a full view of the entire stage, however at a considerable distance so you will not probably be able to see the facial expressions of the performer. Row lettering in the lower tier is A-T and in the upper tier A-Y. Seats in the tiered levels are numbered from 1 up to 31 in some sections. Seat #1 is always closer to the section with a lower number. This means that in order to be closer to the performer, try to pick seats with a higher number in the left-hand side bowl sections or with a lower number in the right-hand side bowl sections. The exact seat numbers are shown on the seating chart above. What are the section numbers in the Perth Arena? How are the rows numbered in the Perth Arena? The rows in the flat floor seating sections are numbered in alphabetical order from A up to R (A, B, C, D, E, F, G, H, J, K, L, M, N, P, Q, R). Please note that there is no row I or O. 200s (Lower Tier boxes) have rows AA, BB, DD, EE. 200s (Lower Tier sections) have rows from A up to T.
400s (Upper Tier sections) have rows from A up to M.
How many levels are there in the Perth Arena? BASEMENT - This is Perth Arena’s public underground car park, which features an elevator for mobility patrons and VIP Suite Holders. GROUND - Entry to Perth Arena is on the ground floor. Doors 1-4 are located on the ground floor, as well as the Granite Room, Indigo Room and Suncorp Bank Lounge. Merchandise and concessions are also available on the ground floor. LEVEL 1 - The main public floor at Perth Arena is located on level 1. Doors 5 – 22 are located on level 1 as well as the Backstage Bar, merchandise and food and beverage outlets. LEVEL 2 - Level 2 is privately accessed by Perth Arena’s VIP suite holders. Suites 1-18 are located on Level 2. LEVEL 3 - Level 3 is privately accessed by Perth Arena’s VIP suite holders. Suites 19-36 are located on Level 3. LEVEL 4 - Level 4 includes doors 23 - 28 and the Reveley Room. It can be accessed via stairs or escalator from level 1, or elevators from other floors. What are some of the biggest acts that will be performing or have performed in the Perth Arena?